Eyal Levi behind the board at Audiohammer Studios. Eyal Levi is infamous for his drum production skills. But he is also a critically acclaimed educator, musician and musical advisor. After attending the prestigious Berklee College of Music, Eyal Levi cut his teeth as the guitarist and primary songwriter in Daath, a progressive death metal band that released albums on Roadrunner and Century Media. 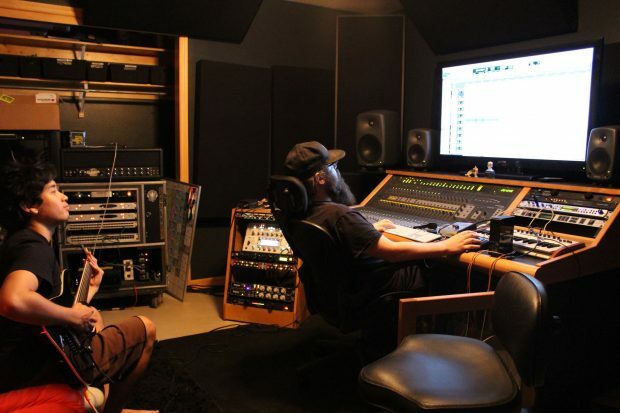 In the studio, he has worked with artists including The Black Dahlia Murder, Chelsea Grin, Carnifex, August Burns Red, Reflections, Motionless In White, and Firewind. An accomplished speaker and educator, he has logged hundreds of hours teaching the next generation the craft of music and drum production. We sat down with Eyal Levi to learn more about how he achieves his drum sound and his Advanced Drum Production CreativeLive course. Can you tell us when and how you joined the Audiohammer team and give us a little detail on Audiohammer’s layout? Audiohammer is the brain child of the production jedi — and my soul brother — Jason Suecof. He started it back in 2003. In 2006, he brought on Mark Lewis as his engineer and since then Mark has emerged as one of metal’s top producers in his own right. My involvement with them goes back to 2006 when they did a rejected test mix for my band Daath. I actually thought it was my favorite, but label politics didn’t let them have the gig. So when the time came for our next record we went to Audiohammer. I guess you could say we connected, because after that I was constantly bringing them work and networking hookups. Around 2010 things were shaky with my band, and Jason told me that if I built a drum room I could come in as a partner in the studio as well as be his engineer. It took me 20 minutes to decide on that one. So I flew down, bought the house across the street because it had the most perfect drum room and layout ever, and the rest shall we say is history. Am I correct in understanding that you own the drum room at Audiohammer? When was it built? How big is it? Who designed it?How would you describe the sound of your room? I own it. It’s the living room of my house [laughs]! It was like this when I bought the place. I saw it once and knew it was the place I had to buy. 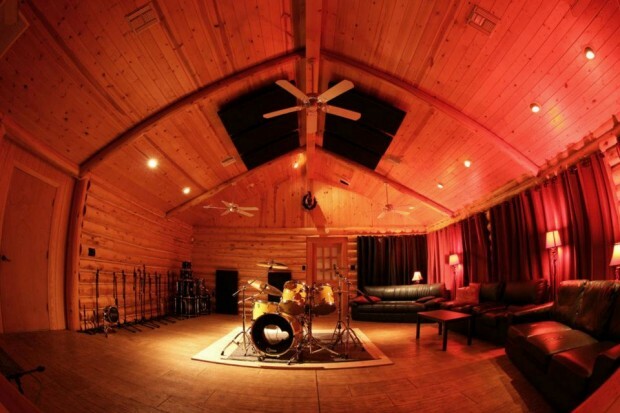 To get a place like this designed would be unaffordable, but by pure twist of luck, there just so happened to be a decently-priced, perfectly laid out, and acoustically superior drum room right across the street from Audiohammer. Who would have thought ? Everything about it is perfect: 18-foot ceilings, 25- x 17-foot walls. Cedar logs provide natural diffusion and give it a very nice and long decay. 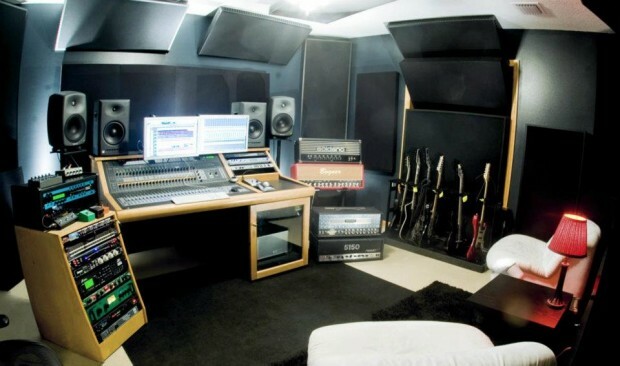 We have custom treatment in the room that can deaden or liven the sound up, based on what we are doing. Recording any acoustic instrument, especially drums, in there is such an amazing experience because the room you are in is such a huge factor in the sound. I hate the word ‘vibe’ but seriously, all your vibe is in the room. Having a great room like that makes the vibe yours to mess up. Drum Room B at Audiohammer Studios also happens to be Eyal Levi’s living room. Ronn rules. He’s my go-to, along with a guy named Matt Brown. Honestly, I feel uncomfortable going into a serious drum session without a tech. It’s not that I don’t feel I can do a good job, but I know that drums sound one way in the room right next to you and they sound completely different under the microphones. I really prefer to have an expert there with me whose job it is to tune the drums while I’m in the control room listening and saying, more of this, more of that, etc. We are definitely going to cover this topic in my creativeLIVE class because it’s one HUGE piece of the drum tone pie. I’d say that viewers are going to learn what a good starting point is and ways to approach drum tuning. Tuning is something that takes a long time to master, but hopefully we can help people not make some dumb, time-consuming mistakes along the way. For a limited time, purchase Eli Levi’s CreativeLive course for only $20! Shop all 20 classes for $20. What is your general approach to drum production? Do you program the kick beforehand? When and how do you make the decision to eliminate recording a kick — and is it difficult to convince a drummer to record without it? My general approach is simple: Metal drummers have to earn the right to a kick drum when recording here. It’s pretty much pointless to record unless the drummer is just ridiculously good. Like say Shannon Lucas, who is a human machine. If the drummer isn’t at that level of precision, then having kick drums in there is going to cause you more harm than good. They will end up all over your room mics and you’ll just have one more thing to filter out and one more reason to neuter your rooms. Personally, that’s not worth it, because I think that rooms are one of the main ingredients in giving drum production its character. So if you know there will be a bunch of editing involved and you’re just going to end up replacing the kick later anyways, just don’t record one to begin with. Problem solved. Seems you stick to and Audix i5 or Shure SM57 on snare — why? I’ve noticed you rock both simultaneously. Is that for options during tracking or later in mix or do you blend them? All of the above. It really depends on how the drummer hits and what you need to bring out based on that. If he hits his snare super light and it sounds like a pencil hitting a pillow, you may need to compensate for the lack of crack in the sound. Though I feel like ultimately you’re going to be eqing an SM57 into sounding like an I5 so I’m starting to lean towards mainly using that. Eyal Levi’s control room at Audiohammer. Do you always setup drum triggers on kick and snare for triggering samples or do you occasionally use the close mics to trigger the samples? Are you convert the audio to midi before sampling? Are your kick and snare samples multi samples or one shots? We convert to midi and then sample off of the midi. This way we can change out samples quickly. Also, using an acoustic trigger leads to undesirable side effects. Like your snare drum getting dampened. If you want to dampen a snare use moon gel, not a trigger. And some are multis and some are single. I use a bunch together. How about during tracking any compression on the close mics (Snare / Toms)?Do you have any favorite analog compressors for close mics? Sometimes I’ll compress room mics going in if I can nail exactly the sound I’m going for but compression can be a touchy thing. I’d prefer to leave that for mix time. DBX 160s are great drum compressors. I back them. But again, I’d rather do that once the drums are recorded. What’s your approach to cymbals and how do you treat your overheads and close mic cymbals differently from each other in mix? I do the same stuff anybody else would to check for phase — i.e., measuring and all that. However, I always give it a good ear check as well as the phase/phase flipped test. At the end of the day, I feel like measurements are an arbitrary thing and you can only really tell by listening. What room mics do you use? Well, one of my main approaches to room mics for this sort of thing is to really aware of what’s going to the rooms. For instance – kick drum or not – rim shots or not – hard hitter / light hitter – etc etc etc. These all determine how I’m going to approach the subject. What drum production editing methods do you use ? My engineer John Douglass and I will be going into detail on this very topic during my creativeLIVE course, about Beat Detective, elastic audio, and manual edits. I use all three depending on the situation. Beat Detective is my 80% of the time solution for drum editing but it’s super important to be proficient with all three methods and I will cover them in detail!